Jane & Me: My Austen Heritage by Caroline Jane Knight, narrated by Alison Larkin, is a memoir of one of the last people to live in Chawton House — the home of Jane Austen — as part of a family. Knight peppers her family stories with historical notes from the ancestors, the letters, and the stories she heard as a child, but she also incorporates the words of Jane Austen from her novels at the most opportune moments. 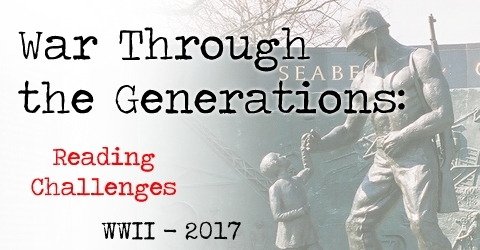 Readers will be delighted to learn how elements from her books were taken straight from her family’s experiences. From the beginning readers know that Knight was forced from her home at age 17 due to financial distress. You can imagine how being forced from an ancestral home would be disconcerting and lead her to distance herself from Jane Austen. But readers will want to learn how her life comes full circle and leads to the creation of the Jane Austen Literacy Foundation. Jane & Me: My Austen Heritage by Caroline Jane Knight, narrated by Alison Larkin, provides a unique look at Jane Austen’s ancestors and explores how family members many years removed can carry some of the same traits and interests. Knight is a curious woman who loves to weave stories about her family members with those of Austen’s novels and real life. She mirrors Jane’s streak of independence, which readers have found so compelling about Elizabeth Bennet. Caroline Jane Knight shares more than Jane Austen’s name and DNA. As a direct descendant of Jane’s brother, Edward Knight, Caroline is the last of the Austen Knight family to grow up at Chawton House on the estate where her fifth great-aunt Jane Austen lived and enjoyed the most productive period of her writing career. Caroline explored the same places around Chawton House and its grounds as Jane did, dined at the same table in the same dining room, read in the same library and shared the same dream of independence. 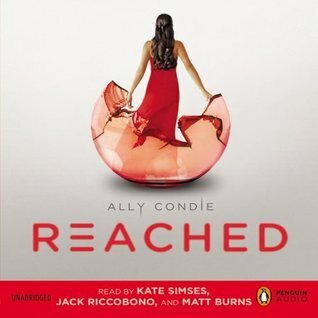 Reached by Ally Condie, narrated by Kate Simses, Jack Riccobono, and Matt Burns, reveals so many things that were forgotten by the characters or that other characters they meet along the way reveal to them. The backstory is here in the third book about the Society and the Rising, and all of the factions that are outside the two main struggling societies. Cassia continues to find her way through the darkness with Ky (who may not always be at her side), and Xander faces his own struggles as the plague ravages the population, even those inoculated with the vaccine provided by the Rising. As a medic, he sees the stillness take hold of his friends and colleagues and the fear in their eyes. He is dutiful and eager to follow those he believes in. Cassia wants to find an end to the suffering; she’s looking for a way to inoculate the Society and the Rising with beauty. She finds it in the Gallery where people come to share their art and poems and songs. Like many things in these controlled societies, the beauty and originality is snuffed out. Ky, on the other hand, still tries to stay below the radar. The only one he believes in is Cassia. This triangle of characters and their love for one another — though different for all of them — is heartening as they tackle the nearly impossible with only their faith in each other to guide them. Although there are moments of repetition when Cassia begins to regain some of her memories long after she was forced to take a red pill to forget, it is in line with the world Condie has created. The narrators are well matched with their characters, though Xander’s point of view is less robotic in this book compared to the last. The dialogue for him as improved. Reached by Ally Condie, narrated by Kate Simses, Jack Riccobono, and Matt Burns, is a series of books that requires patience with the world and tension building. Readers will be satisfied with its conclusion as these societies tackle a mutated plague together and come out the other side eager to rebuild and collaborate with one another (even if only tentatively). Crossed by Ally Condie, narrated by Kate Simses and Jack Riccobono, is the second book in the series and is told from alternating points of view. Cassia is on a mission to find Ky after he was taken from her home province. Their story has been star-crossed since the beginning, and she is confident that her choice to find him in the outer provinces is the best one for her. While she still loves her best friend and match, Xander, she does not believe she can live without Ky. Although this is a story of young love, Condie has created an intricate society in which everything is controlled from the 100 poems the society has kept to the loss of writing letters. In this controlled experiment, these children are told the rules and how to be from the moment they enter school. Because people are given options that make it appear as though they have choices, many do not question the rules of the society, but a rebellion has been brewing in the background since the 100 poems to be kept were chosen. As readers are shown more and more of the society and layers are pulled back, they will have more questions. Cassia is just beginning to see the world through new eyes whereas Ky has seen a little too much of its dark side. She pushes to know more, and he wants to hold back and just be. The different points of view helped flesh this out more for me, as Ky has knowledge that the cloistered Cassia does not. The use of poetry by Condie is intricate and adds to the mystery, but when will we meet the pilot or know what is really going on? 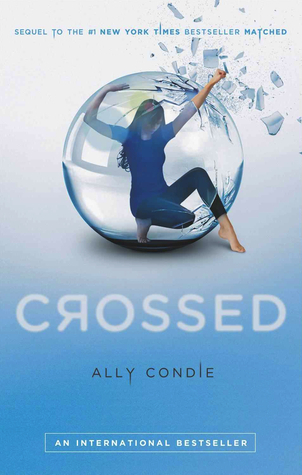 Crossed by Ally Condie, narrated by Kate Simses and Jack Riccobono, is a satisfying second book, but it seems like both the first and second book are building and building the societal tension for book three, Reached. The advantages in this book are a little more knowledge and a little more freedom for the characters and the introduction of new characters. 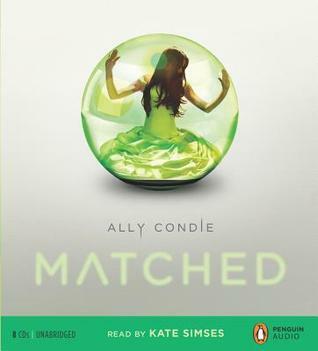 Matched by Ally Condie, narrated by Kate Simses, is set into a future where many of the choices of the society are manipulated or made for its residents. On the date of her matching — a process through which her mate is chosen — Cassia gets a glimpse of another future, another choice. Xander, her childhood friend who lives in her neighborhood, is her match, something that doesn’t happen that often. But her interactions with another boy, Ky, in the neighborhood, lead her to question more than just the matching system. Although aberrations in the perfect system have created a sense of unease for Cassia, part of her still wants to believe that they system does things for good, at least the good of society. Her hikes with Ky, however, reveal that not all of the society’s decisions are for the best and not even done with the best intentions. Her inner struggle is exacerbated by the words her grandfather said to her before his passing and the advice he had given her in the past. 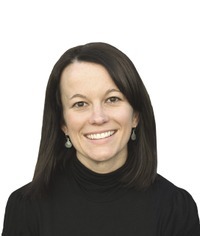 Condie has created a world that is believable, but it seems like there is too much that is not reveals about this society and its past. Everything is kept very close to the officials’ vests, and readers are likely to see that it is for very good reason in subsequent books (or so I suspect). Simses is an excellent narrator for a young girl who is torn between the way she knew things to be and the way she sees they could be. Her narration of the male characters are well done, too. Matched by Ally Condie, is a quick listen on audio and even though readers know Cassia is about to commit an infraction she cannot come back from, not too much happens in the book. Symbiont by Mira Grant, narrated by Christine Lakin, is the second book in the Parasitology series, so if you haven’t read book 1, stop here. Read my review for book 1, Parasite. Our protagonist Sal Mitchell finds herself in the hands of the enemy more than once in this book. Upon escaping from her father’s government facility, she finds herself thrust in the hands of another enemy. Much of the book is spent unraveling the plots of the fully-functioning tapeworm humans (chimera) who want to rid the world of humans — naturally. Led by Sherman, her sometimes handler at SymboGen, Sal finds out that the tapeworms were not only engineered to help people with health problems, but they also seem to have specific skills. Like any species that is evolving, there are those that have fully taken over their human hosts and there are others who act more like zombies and devour humans on sight with little cognitive function. Sal is frightened of all of the above because she is on the side of life — living in harmony. Is humanity ready to accept these tapeworm takeovers as people and are the tapeworms ready to let bygones be bygones and make peace with their creators? Even when she returns to Dr. Kim and his mother at their undisclosed lab location, the ethical lines of science are blurring further than she could imagine, especially when Dr. Stephen Banks enters the picture. Lakin continues to narrate this winding and repetitive story well, but the repetition got to me by the end. 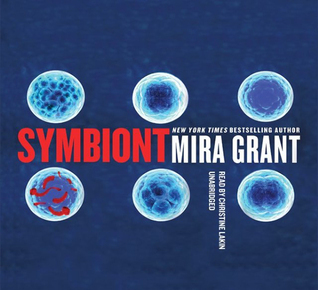 Symbiont by Mira Grant, narrated by Christine Lakin, could have been a great middle book with better editing and less back-tracking over plot points established in the first book. Certain aspects of the backstory from the first book seemed to be too constraining for the author, who reinvented some of the backstory here to suit her needs. This middle book just seemed like one bad car chase after another toward the end, and Grant did herself a disservice in that. However, the cliffhanger at the end and the overall story mean I must see this one to its conclusion in Chimera. 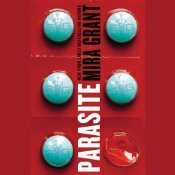 Parasite by Mira Grant, narrated by Christine Lakin, is another series of books in which the world has been turned upside down. Sally Mitchell was involved in horrific car accident and a genetically engineered worm is introduced to her body. When she wakes up, she has no memory of her life before and must begin again, learning how to walk, talk, and interact. In a world where germs are eradicated and worms are used in symbiosis with human bodies to ensure the immune system functions properly, it’s no wonder that things go haywire in 2027. With only six years of life to build upon, Sal Mitchell must create a new life for herself and leave the old Sally behind. With her doctor boyfriend and continued checkups at SymboGen Corp., her life is pretty carefree, unless you like being poked and prodded. Her father, a general, works in a lab that keeps a check on the nation’s diseases and outbreaks, and her sister works there too as an intern. Sal may be a lab rat, but everyone around her seems to be a scientist. The entire world has bought into the Intestinal Bodyguard worm marketing of SymboGen, except for Sal’s boyfriend Dr. Kim. Grant has become a go-to author for me when I want something fresh. Her books push the envelope of science as far as it will go to create a world that resembles our current reality but is horrifying. Her ability to create a believable world in which science has gone beyond the bounds of ethics and created something they can no longer control is nothing short of a miracle. You could step into these worlds and believe they are your reality. And that is very scary. Lakin does an excellent narrative job as she voices Sal and the other characters, making each one distinct without making them sound ridiculously accented. Parasite by Mira Grant, narrated by Christine Lakin, is spell-binding and would be great for a book club discussion about medical and scientific ethics. This is book one, and you can bet I’m reading the rest of this series. Station Eleven by Emily St. John Mandel, narrated by Kirsten Potter, opens with the on stage demise of Arthur Leander, a famous actor who has a number of wives and feels disconnected from his own son. While a few of the characters are connected with Leander, those connections really don’t matter in the grand scheme of the novel, and many of the tertiary characters met at the beginning die weeks into the epidemic after his death. Mandel may be using the distance from the characters to create a sense that who lives and dies is random and without purpose, but it’s a blunt instrument that leaves little room for connection between the reader and the characters that have adventures in the book. The Traveling Symphony is the most intriguing with its odd cast of characters and Kirsten Raymonde’s tattoo from Star Trek: “Because survival is insufficient.” She was present on stage as Leander died, and her life since the epidemic is one she would rather not have endured, though she maintains her spirits. As these cast members, for that’s how they are portrayed, deal with the aftermath of civilization, it’s a wonder that any art or creativity remains, especially when there are men like the Prophet willing to engage in bigamy with young girls and spout nonsense to their people about being the chosen ones — so long as they obey him. 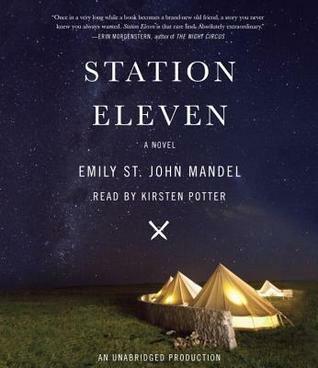 Station Eleven by Emily St. John Mandel, narrated by Kirsten Potter, was a 2014 National Book Award Finalist that wowed many, but I felt a bit distant from the action and the characters. While I enjoyed this story and the vignettes and the back and forth between the present and the past in this post-apocalyptic story, Mandel kept me at too far a distance from her characters. She’s attempting to comment on the need for something more than just survival when disaster strikes and how to do it, but much of it is lost in the mire. Like the traveling artists that take to the pop-up cities and towns after the Georgia Flu kills 99% of the population, readers will feel like they don’t get a deep feel for the places visited or the people they spend time with. 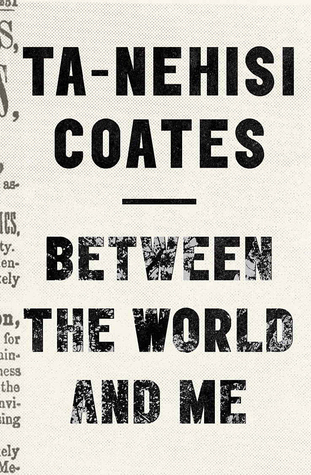 The stories are interesting and kept my attention, but there was too much time spent wondering where it was all going and what the point was. Her fourth novel, Station Eleven, is forthcoming in September 2014. All three of her previous novels—Last Night in Montreal, The Singer’s Gun, and The Lola Quartet—were Indie Next Picks, and The Singer’s Gun was the 2014 winner of the Prix Mystere de la Critique in France. Her short fiction and essays have been anthologized in numerous collections, including Best American Mystery Stories 2013. She is a staff writer for The Millions. She lives in New York City with her husband. The Murder House by James Patterson and David Ellis, narrated by Therese Plummer and Jay Snyder, is a thrill-a-minute, as Det. Jenna Murphy gets re-acquainted with Bridgehampton at a time when Noah Walker is on trial for murder. 7 Ocean Drive, the Murder House, has a violent and unforgiving past, and Walker finds that he gets caught up in that darkness no matter how much he wants to stay under the radar. Murphy has resigned from her Manhattan police gig and returned to a place she hasn’t been in more than two decades. As she strives to put the man in jail who she believes killed her uncle, the police chief of Bridgehampton, she’ll have to compromise the one thing she’s held onto since then — her integrity. Therese Plummer and Jay Snyder do an excellent job of narrating this suspenseful murder mystery, with Jay’s voice even creepier as the killer’s, whose identity remains unknown until the end. In this twisted tale, Jenna and Noah embark on parallel journeys that lead them into one of the darkest places in the tourist trap — the Murder House. It’s history dates back to the 1800s, and the family that owned it was always under suspicion but never tried or convicted of any crimes. Long-since dead, the family’s secrets come to light, and one of them hits very close to home for Murphy, who has lost her uncle and her job as she continues to ask questions about the recent murders of a powerful Hollywood player and his mistress and Walker’s role in them. 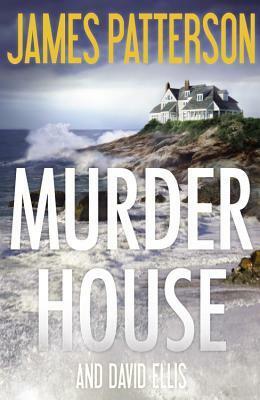 Despite moments that seem forced and lines that are repeated a little too often, as well as bad decisions that are made by a supposedly talented cop, The Murder House by James Patterson and David Ellis, narrated by Therese Plummer and Jay Snyder, is a heart-pumping thriller that will leave readers on the edge of their seats. David Ellis is a lawyer and the Edgar Allan Poe Award winner for Best First Novel for Line of Vision. 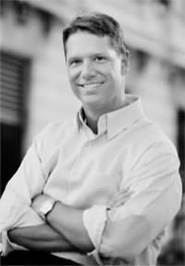 Ellis attended Northwestern Law School and began his legal career in private practice in Chicago in 1993. He served as the House Prosecutor who tried and convicted Illinois Governor Blagojevich in the Impeachment Trial before the Illinois Senate. He was elected to the Illinois Appellate Court in 2014 and took office December 1, 2014. Ellis currently lives outside Chicago with his wife and three children.